Over a million tourists a year pass through Siem Reap, making it the fastest growing place in Cambodia outside of Phnom Penh, the capital city. With a history dating all the way back to the year 802, visiting Siem Reap is a highlight for many people traveling through Southeast Asia… with a wealth of activities and attractions that go far beyond the ancient ruins down the road. The temples of Angkor Wat are Siem Reap’s main draw, but did you know there are plenty of other interesting things to do in the general vicinity? From the Angkor National Museum to the Land Mine Museum to a hot air balloon ride over the Angkor ruins, you can explore a number of other destinations that help make Siem Reap the most popular tourist destination in Cambodia. There are some travel requirements to get to Cambodia. First, you have to take care of the Cambodia visa. Before you can get one, you have to show a passport that’s valid for at least six months beyond the entry date. Cambodia also offers an easy, online alternative to getting your visa: the Cambodia e-Visa that costs an extra $5 in processing fees but saves you the time and effort that comes with getting a regular Cambodia visa. Once you're in Siem Reap, it's not too challenging to get around the country. Your choice of transportation within Cambodia will depend on the climate, the distance you wish to travel, the time you have, and the money you want to spend. Arrange a taxi with your hotel concierge or book a day trip from a tour company to make it easier on the road. The winter months from November to February represent the peak travel season for Siem Reap. These months are cool and dry, avoiding the extremes of heat and precipitation you’d find in other times of the year. Weather is crisp at night and just cool in the daytime. A number of festivals also take place during this season. The temples are at their most beautiful during the rainy season: the grass is green and lush, the air seems clearer (the haze being washed out by the rain). Siem Reap in the rainy season is, weather permitting, a photographer’s favorite time of the year. In spite of the influx of visitors (and foreign aid), Siem Reap is still part of a conservative society, one rooted in Buddhism and strong (if old-fashioned) values. Cambodians understand that, as outsiders, we may be unfamiliar with their ways, but if you know the basics of etiquette in Cambodia, you’ll go a long way in winning their trust. If you happen by a Buddhist temple, remember to be respectful and bring a shawl to cover your shoulders. Also, wear shoes that are easy to slip on and off as most temples don't permit you to wear them inside. “Orphanage tourism” in Siem Reap, while popular, should not be encouraged, either with your money or your time. Despite outward appearances, many orphanages are actually for-profit enterprises that needlessly split families apart and play up squalor to attract tourist donations. Siem Reap can’t be covered in one day—you’ll need at least three days to cover the huge expanse of the Angkor temples and other attractions in the area. So unless you have a friend in the area with an extra bed, you’ll need to stay at a Siem Reap hotel or hostel while you’re in town. The U.S. dollar goes far in Cambodia, so although there are youth hostels for those on a budget, you can most likely find an affordable high-end hotel for the night. 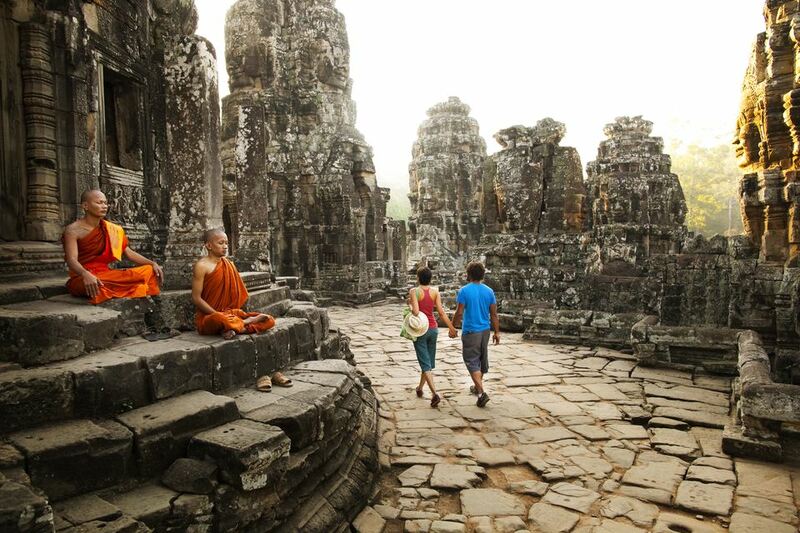 The temples in Angkor are Siem Reap’s biggest draw, attracting upwards of a million foreign visitors a year. Despite their age, the temples retain much of the majesty they have had since they were constructed in the 12th century as the devotional centers of a sprawling Khmer Empire. The Khmer Empire is long gone, but the temples they have left behind are now a UNESCO World Heritage site and a source of awe for many generations of travelers. The Angkor temples are all that of what once was a powerful empire that ruled much of today’s Cambodia and parts of Thailand, Laos, and Myanmar. At first glance, visitors may be entranced by the complex’s lotus-blossom towers, enigmatic Buddha images, and dancing girls (​apsaras). Upon closer inspection, you'll realize that the temples are only the visible remnants of an advanced civilization in Southeast Asia, one which depended on—and was undone by—the abundance of water in the area. 10 Things to Do in Siem Reap, Cambodia - Angkor Wat's Just the Beginning!